I often note that a particular album may need space to grow on the listener and in some cases, this can take some considerable time. For Notes on a Scandal, my first listen was in three or four chunks as, after 15 minutes or so, I just couldn't really face it any more. Perhaps it's more of a mood thing, but it must be said that Notes on a Scandal, as the title suggests, is not perhaps the cheeriest of subjects and the music reflects this. I noted with his score to The Hours, that minimalist scores - Glass' in particular - require a certain range of orchestral timbre to make them interesting as a stand alone experience. Fortunately, while Notes on a Scandal is fairly standard in its approach, the level of drama places it considerably above The Hours and its rather leaden approach. 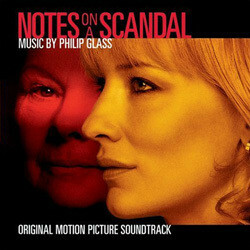 Perhaps the most surprising thing about Glass' score is just how dramatic it is, often sounding as if it should be from a movie quite a number of decades previous (interesting that it comes out around the same time, and is nominated alongside, Thomas Newman's The Good German, a deliberate homage to the golden age). Cues such as Discovery seemingly draw on the kind of menace that Bernard Herrmann might have brought, although the harmonic language is a little more contemporary. Indeed, one can't help but feel that many tracks would be more suited to a horror film than a drama. Having never heard or seen either of the Candyman films, I had wondered how Glass might write for horror, but Notes on a Scandal gives some indication. If all of the above makes it sound it good on disc (and it is), then it's interesting to note that, other than Horner's All the King's Men, no score received more derision in the context of the film itself in 2006 that I can recall. Curious that it should receive an Oscar nomination. Taken purely on its own terms, Glass' score is considerably more interesting and dramatically worthy than The Hours. The darkness running through the music here is palpable, but not oppressively so (despite the impression from my first listen) and one can certainly understand why it might seem a bit much for a character based film, but as I've often noted, scores that overwhelm the film largely make great albums and this is no exception.